Whisk together the vinegar, lemon juice, garlic, oregano, salt, pepper, and olive oil. Set aside. Combine pasta, tomatoes, onion, green and red peppers, cucumber, olives, and feta cheese in a large bowl. Pour vinaigrette over the pasta and mix together. Cover and chill for 3 hours before serving. Maybe this salad could be good but OMG was that dressing BITTER. I was embarassed to serve this. Removing from my recipe box for sure. 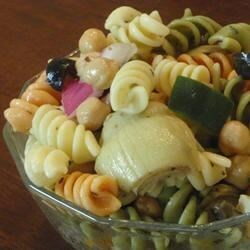 This is my FAVORITE cold pasta salad! Ummmm. Everybody always asks for the recipe. Perfect for potlucks. Made this for a potluck this week. Everyone raved. I used a whole cucumber, a cup of feta and a cup of black olives. Yummy!!! I used 1 cup feta cheese (I LOVE feta) and the tri-color rotini. It would also be good with some grilled chicken.